If you’re interested in learning more about either of these projects or in how I’m building them, I have a blog, Anglophile in Academia, where I post updates. I write a new post every Monday, and I’d love to hear comments and feedback from all of you! Progress report: Here’s where I announce the date of the sneak-peak release of Songs of the Victorians. Design: Here’s my most recent post on designing the homepage and song display page for Songs of the Victorians, here’s a post on the redesign of Songs of the Victorians and the rationale behind it, and here’s my post about logo designs for both sites. I’ll be making my weekly updates for the rest of the semester (and beyond), so make sure to subscribe or check it out every week! Cite this post: Annie Swafford. 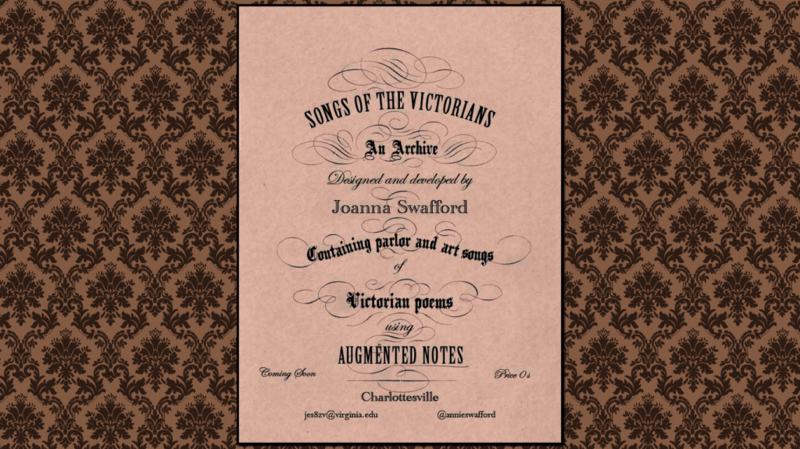 “Announcing My Blog, Songs of the Victorians, and Augmented Notes”. Published February 26, 2013. https://scholarslab.lib.virginia.edu/blog/announcing-my-blog-songs-of-the-victorians-and-augmented-notes/. Accessed on .